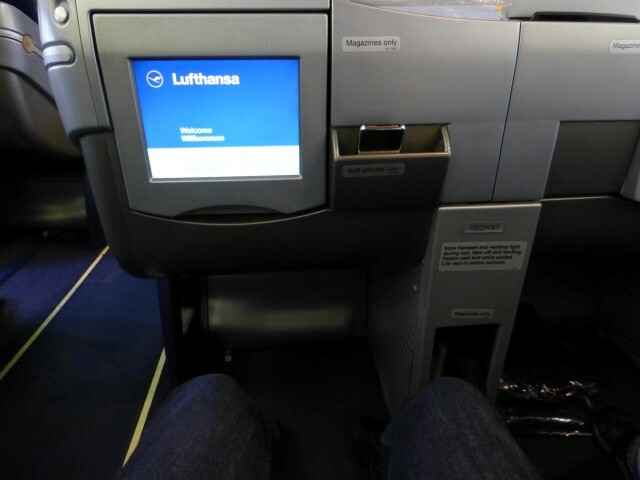 Our trip to Vietnam started off with a quick business class flight on Lufthansa to Frankfurt. 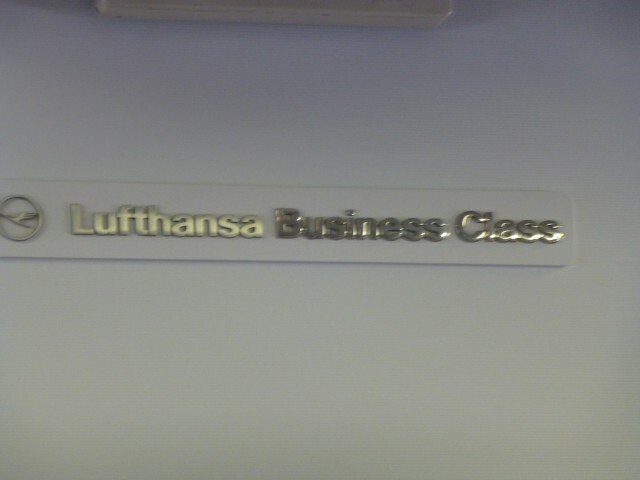 I had only flown Lufthansa intra-Europe before. We all know the business class flights on intra-Europe flights are just an economy seat with the middle seat blocked. 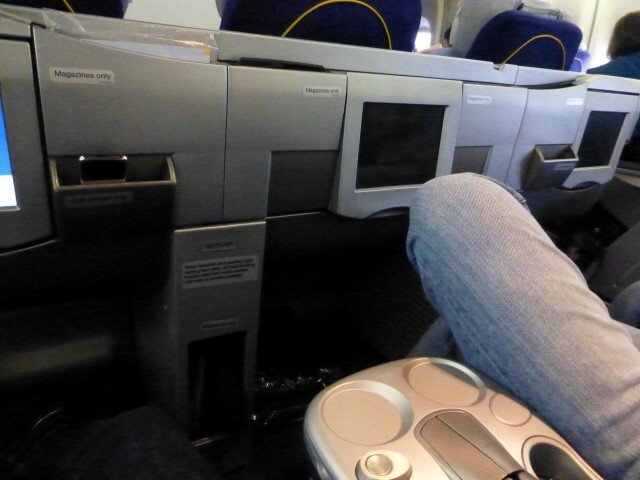 No lay flat seat, no improved IFE, nothing special whatsoever. 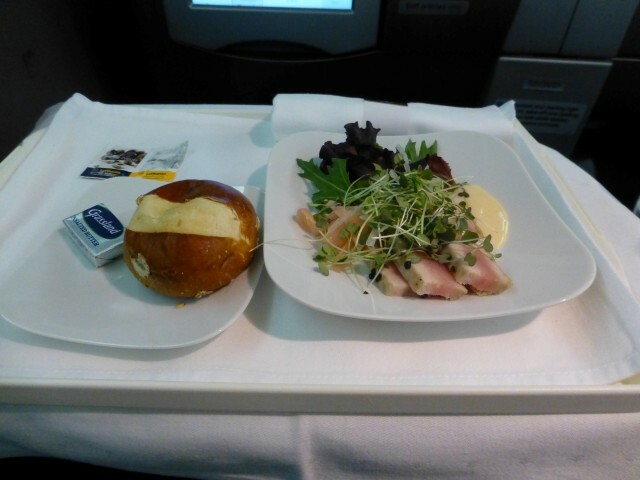 I was excited to try a real business class product on Lufthansa. Lufthansa leaves from Terminal One at O’hare (along with United and ANA). Both Lufthansa and ANA have separate check-in areas at the first door as you approach T1. There were a surprisingly large number of passengers just milling about. It was obvious they were flying on the Lufthansa flight that evening, but it was unclear exactly what the hell they were doing. The business class check-in counter was empty and the rep was very helpful. We had a minor hiccup as she said she couldn’t check my bag all the way through to Hanoi — since technically we were arriving two days later. After a bit of help by the supervisor, we were all set and ready to go. After a quick stop at the United Club we headed to the sea of humanity that is the boarding mayhem of a Lufthansa flight. We were flying on a Boeing 747 – the first time I’ve been on this amazing plane since I flew an old United version to Denver in 2002. Love that plane. 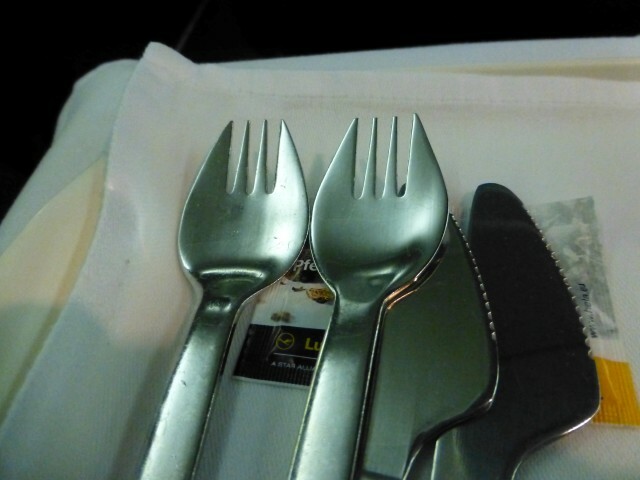 The business class configuration on this plane was a 2-3-2 and we were in the middle section. MS was generous enough to take the middle seat. 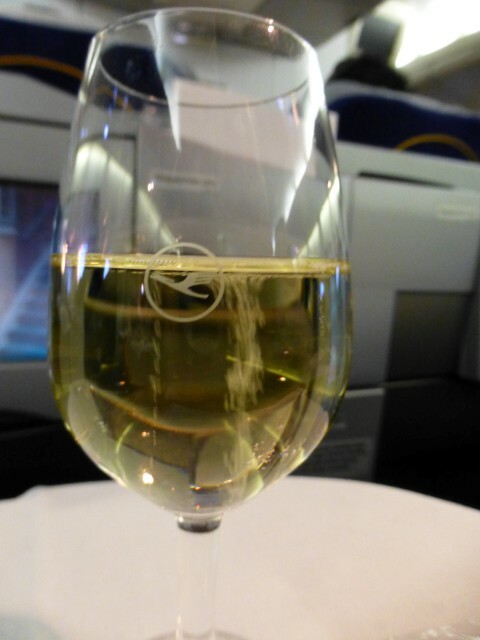 Pre-departure champagne and the Lufthansa Bird. I always attempt to speak only German while on a Lufthansa flight and this time was no exception. The flight crews always humor me. I think I do pretty well, but then again, I’m not chitchatting with these folks either. I’m ordering food, drink and water without ice (Wasser ohne Eis). 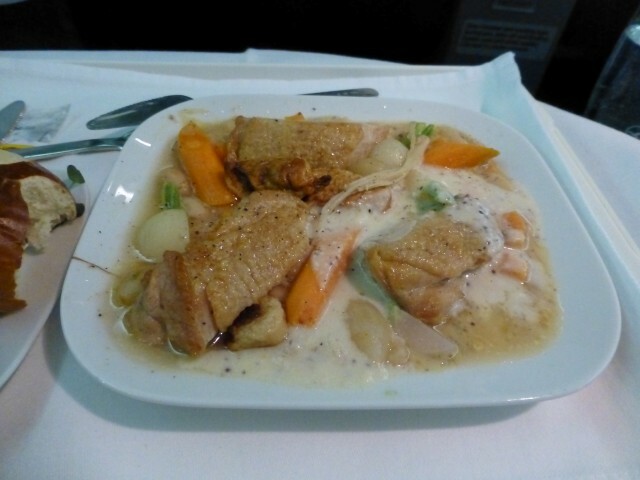 I really enjoy flying on Lufthansa, but they sure aren’t known for their food. A couple of the items I really enjoyed and would actively order again at a restaurant, but most I could take or leave. Seared tuna salad – favorite part of the meal. 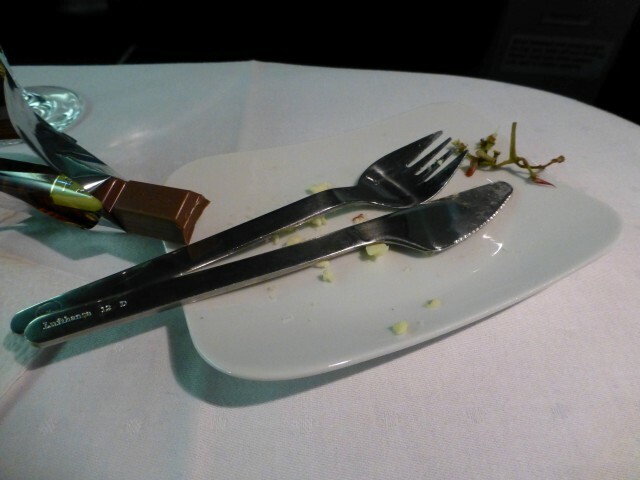 Salad course with a pretzel roll – why isn’t this always an option? The cassoulet was flavorful, but dry. The fruit, cheese and chocolate course was pretty damn good. 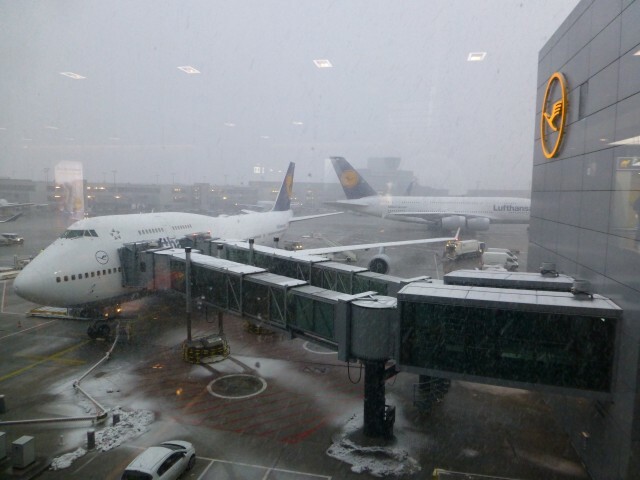 The beautiful 747 we flew from Chicago — in snowy Frankfurt. 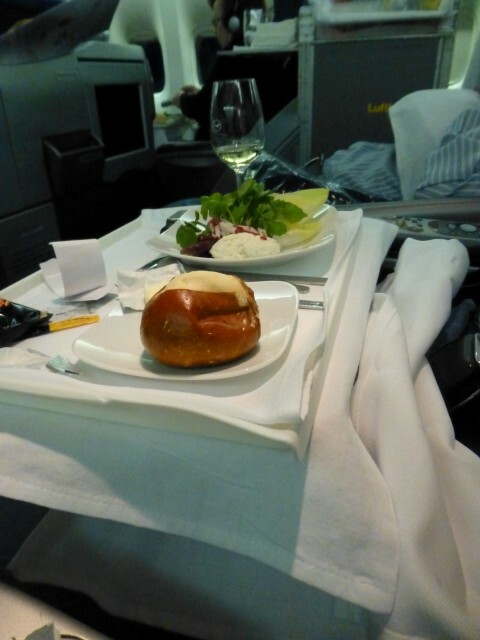 What do you think of Lufthansa’s trans-Atlantic business class? How much better is the First Class product compared to Business? If you had to fly economy to Europe, would you choose to fly United or Lufthansa?